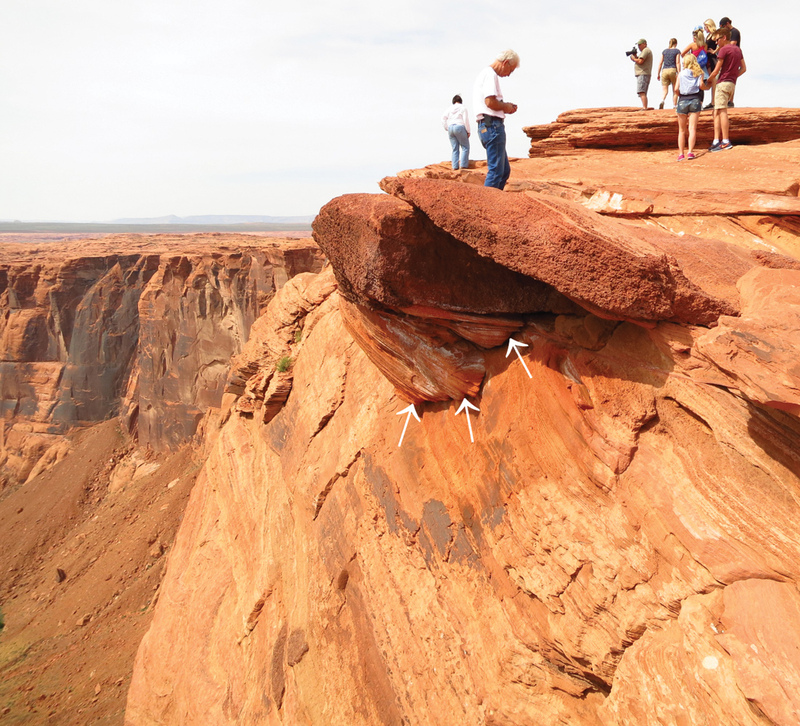 An open joint (indicated by white arrows) has partially detached a Navajo Sandstone block and creates a high hazard for visitors to the popular Horseshoe Bend Overlook. Stunning landscapes and a variety of recreational opportunities centered on Lake Powell attract nearly 2.5 million visitors annually to Glen Canyon National Recreation Area (GCNRA). Geologic processes that shaped this rugged landscape are still active today, and can be hazardous to visitors, employees, and infrastructure. To provide the National Park Service (NPS) with necessary geologic-hazard information for future park management, the Utah Geological Survey (UGS) has nearly completed a geologic-hazard investigation of two high-use sections of the recreation area: a 297-square-mile area near the Bullfrog and Halls Crossing Marinas, and a 117-square-mile area centered on Wahweap and Antelope Point Marinas near the Utah-Arizona border. Erosional geologic processes dominate the Glen Canyon region. Canyon entrenchment and widening via stream erosion (primarily floods) and mass wasting (primarily landslides and rockfall) create the principal geologic hazards with which tourists and NPS staff must contend. Both flooding and rockfall have caused multiple fatalities and many additional injuries. On an annual basis, the most widespread and dangerous geologic hazard in GCNRA is flooding. Flash floods are sudden, intense, localized events that occur in response to heavy rainfall that often accompanies summertime monsoonal thunderstorms. 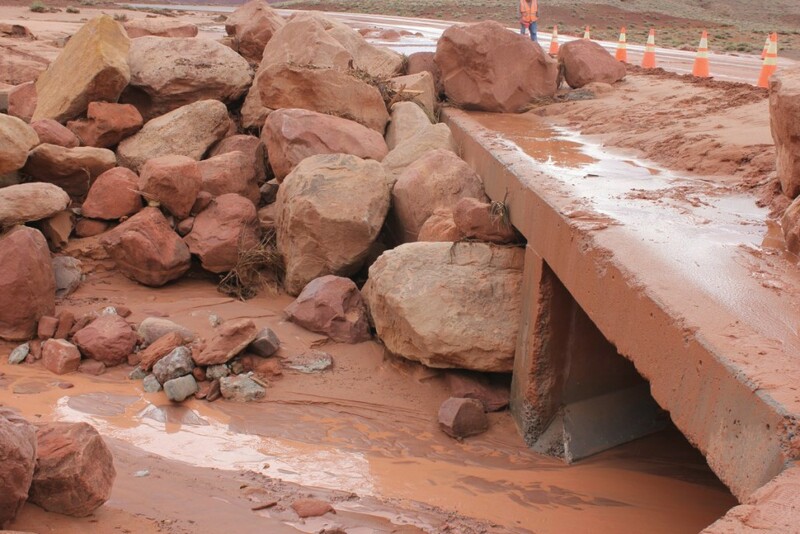 Viscous, sediment-laden floods (debris flows) have repeatedly destroyed or damaged roads near Lees Ferry, where several short, steep drainages have headwaters in the easily eroded, clay-rich Chinle Formation. Narrow, bedrock-floored canyons (slot canyons) are particularly prone to the effects of flash floods because they commonly lack escape routes, are remotely located, are subject to periodic logjams that present troublesome obstacles, and many can hold cold floodwater for weeks that can contribute to hypothermic conditions. Since 1961, 15 people have died in GCNRA due to canyon floods. Eleven deaths occurred on August 12, 1997, when a severe thunderstorm caused a flash flood that swept 11 tourists and a tour guide down Antelope Canyon near Page, Arizona—the tour guide alone survived. The increasing popularity of canyoneering—hiking, climbing, and swimming through slot canyons with the aid of technical climbing equipment—will likely cause an increase in flood-related incidents within GCNRA. The geology of GCNRA is conducive to widespread rockfall hazard. Rockfalls are particularly prevalent and hazardous where easily eroded bedrock units create slopes below more resistant bedrock formations. Four resistant-over-easily-eroded bedrock pairs are particularly susceptible to rockfall in the study area: Shinarump Conglomerate over the Moenkopi Formation, Wingate Sandstone over the upper Chinle Formation, Navajo Sandstone over the Kayenta Formation, and Entrada Sandstone over the Carmel Formation. Erosion of the “weak” underlying units and subsequent undercutting of the more resistant bedrock formations leads to many rockfalls. Natural breaks or joints in sandstone are prominent features in the Glen Canyon region and, depending on their orientations and frequency, can significantly increase the rockfall hazard. 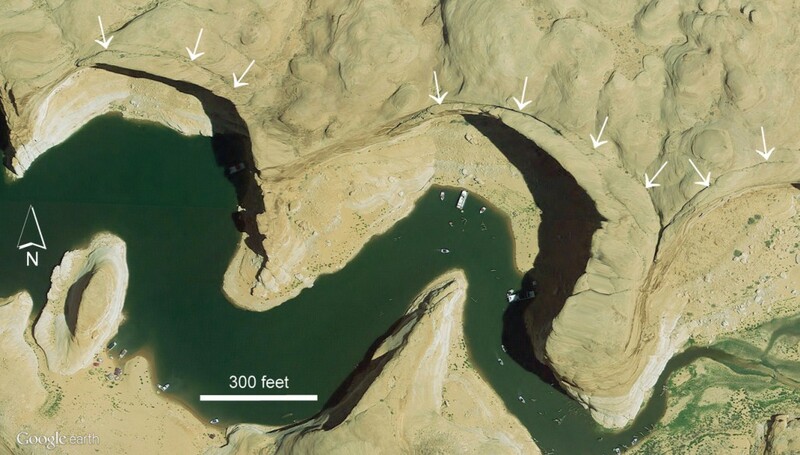 Alcoves and other overhanging rock masses along the Lake Powell shoreline make attractive mooring spots and campsites for boaters, particularly in the summer when alcoves provide shade, cooler temperatures, and shelter from thunderstorms. Unfortunately, alcoves also generate frequent rockfalls. Fatal incidents in 1975 and 2007 were both attributed to falling rock from alcove ceilings that destroyed boats moored below. At least two additional fatalities in GCNRA occurred when small rock masses upon which people were standing broke loose causing both the rock and the person to fall down near-vertical slopes. This most recently occurred at the Horseshoe Bend Overlook in July 2010. Our geologic-hazard mapping is based primarily on geologic mapping previously completed by the UGS Geologic Mapping Program. Soils mapping by the Natural Resources Conservation Service, incident reports from the NPS, aerial photograph interpretation, a limited number of geotechnical reports, and both ground- and boat-based field reconnaissance were also key data sources used to evaluate and map geologic hazards. We compiled and mapped geologic-hazard data at a scale of 1:24,000 in a geographic information system (GIS) database. Geologic hazards mapped in the Glen Canyon study area are (1) flooding and debris flows, (2) rockfall, (3) landslides, (4) soils susceptible to erosion, (5) gypsiferous soil and rock, (6) expansive soil and rock, (7) collapsible soil, (8) surface faulting, and (9) liquefaction. An accompanying report will describe each geologic hazard and provide background information on data sources, the nature and distribution of the hazards, and possible hazard-reduction measures.